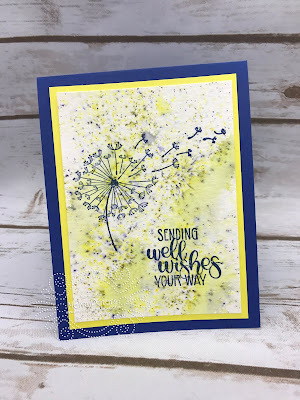 Today's share uses the Dandelion Wishes stamp set and Brusho Crystal Colours. I love how bright and cheery the card turned out. When I started, I didn't really have an idea what it would look like or what colours I would use for cardstock. That's one of the things I love most about using Brusho Crystal Colours - you don't really know what the finished product will look like. First, here's the card and then I'll tell you how I made it. Brusho Crystal Colours are highly pigmented crystals that give a burst of colour! The crystals are very fine, so you create a shaker in the container by punching a few holes in the top and then gently shaking crystals on to a piece of cardstock or water colour paper. For this card, I sprinkled Moss Green crystals on my watercolour paper and then spritzed the paper gently with water. I know I said Moss Green! But check out how it turned more yellow! That's the reason why I didn't plan the colour of the ink or cardstock until I had created the base. 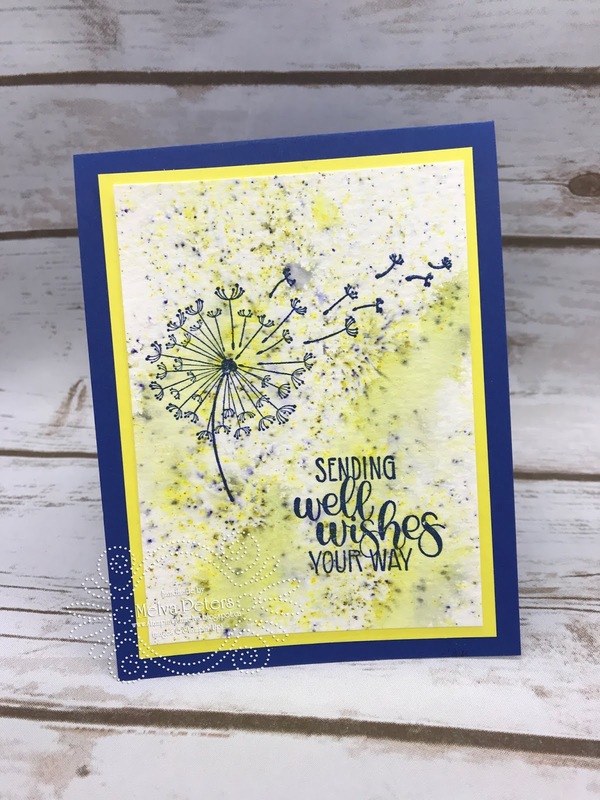 Once the water colour paper is dry, you can stamp on the image and sentiment in Blueberry Bushel and adhere it to Pineapple Punch card stock and finally adhere this piece to the Blueberry Bushel card base.